Revisit this classic dessert with a low-fat version made with raspberry sorbet and fresh seasonal peach, tucked under a blanket of soft, fluffy meringue. Preheat the oven to 230°C, gas mark 8. Place the flan case on an ovenproof serving plate or flat baking sheet. Cut the peach in half and remove the stone before slicing thinly. Scatter the peach slices over the flan base and spread out evenly. Remove the sorbet from the freezer and allow to soften very slightly. Meanwhile, whisk the egg whites until stiff peaks form. Gradually whisk in the sugar, 1 tablespoon at a time, until the meringue is firm, thick and glossy. Quickly spoon the sorbet over the flan base in a rough dome shape. Top with the meringue using a palette knife or spatula to ensure that the sorbet and the flan case are completely sealed. Cook in the oven for 3-4 minutes or until the meringue is just starting to turn golden. Cut into slices and serve immediately. 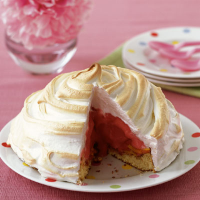 Make sure the oven is very hot before cooking the baked Alaska. The dessert should be removed as soon as the meringue starts to turn golden. The sorbet remains frozen as the meringue acts as insulation. This recipe contains raw egg and is therefore not suitable for the young, pregnant women, elderly people or those with a weak immune system.